Delete All Facebook Posts – Over the past few years, Facebook has developed many features inside their dashboard.People actually use those stuff while chatting with their friends.It is the number one social networking site for all the time.Today I am going to show you how you can delete all Facebook posts in bulk. Generally, we keep timeline posts but in some cases, we need to delete posts anyhow.I deleted my timeline posts just because of some third party integration issue.I saw every day new posts are being posted by that app.So far I decided to delete all posts from my timeline to make it clean. How To Delete FB Timeline Posts ? You have two choices to remove posts from the timeline.You can delete each post manually or take smart move using bulk remover.For manually go to timeline and from right side menu click on delete option.It will delete that post. However, you can check activity log option for better post control.This log displays each year post details along with particular month.You can find activity log from the right sidebar. 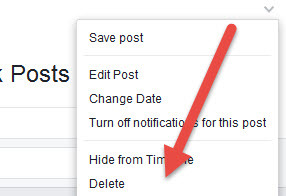 How To Delete All Facebook Posts In Bulk ? This is the easiest way to delete all posts from Facebook’s timeline.You can delete posts by year and month.This job is done by Facebook Post Manage Chrome Extension.You need chrome browser to use this addon.This extension not only deletes posts but also has “like hide/unhide,unlike,backup” options. Go to Google search engine and type “Facebook Post Manager”.It shows the official chrome extension page link.Click on the link to add the extension. Note : While searching this extension please make sure that you are using Google chrome browser. How To Use Facebook Post Manager ? Year : Select the particular year to delete posts from the dropdown menu. Text Contains : This is s filter option which scans the text you enter.If the post’s text is matched then it is considered to be deleted. Text Not Contains : Similarly, if you want to avoid some text use text not contains box. Prescan On Page : Check the box for preview screen before deleting.If you don’t want to see just uncheck the box. 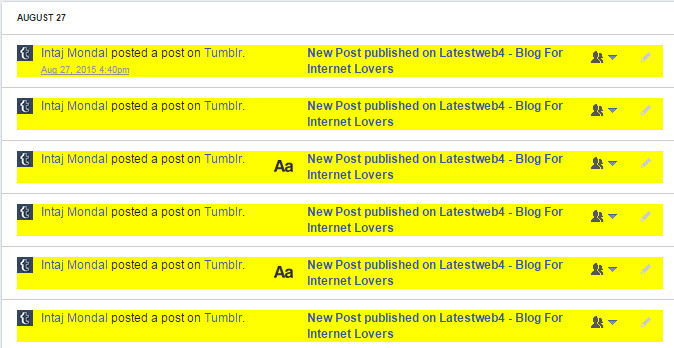 Once you setup all click on Delete button and wait for its processing.All posts that you wanted to delete will be marked with the yellow background. 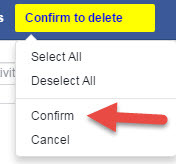 The above posts are ready to be deleted by Facebook post manager.Now it needs final input from your side.You can see “Confirm To Delete” option at top of the page.Click on it and confirm now.It will start deleting all posts one by one. Note : Deleted posts can not be recovered.During the delete execution please do not refresh the page.Once deletion is completed it will be refreshed automatically. Facebook post manager is a great extension available in chrome.You save time and delete spammy posts.It is really easy to manage.I recommend this method because it’s safe,secure & save time.If you need to delete 1 or 2 posts just do it manually.